Example Letters Written to Gloucester Diocese about Willersey Glebe Land Sale. Six example letters to Gloucester Diocese about possible Willersey Glebe Land Sale. Here is the latest housing Council draft plan on the Willersey website and here is the same document on the Council website. It is a very large file (over 13MB) so it may take a time to load. Be patient! Being towards the end of the alphabet, the major section for Willersey is at the end from page 121 onwards. There is also the larger ( 39MB ) consultation document both on the Willersey website and Cotswold District Council website. ( Be very patient. Depending on your broadband speed this could take up to 12 minutes or more to load. ) The entry for Willersey starts on page 112 of this document. Copies are also be available for inspection at the Council's offices in Trinity Road, Cirencester and the Moreton Area Centre, Moreton-in-Marsh. February and July 2015 - Willersey Housing Increase Plans. The local plan has allocated 85 houses to be built in Willersey during the period 2011 to 2031. This is an increase of 35 since the 2014 consultation with CDC. Currently there are a known 121 houses on major developments within Willersey with current planning applications at CDC. These have been submitted by 2 developers. There are a further 5 individual houses with approved or applied for planning consent within Willersey. There are an additional 20 houses on the Broadway Rd which have been given planning consent following appeal. At February 2015 146 additional houses are proposed for Willersey. See above for details and also the documents below. This is a 34% increase in the size of Willersey. If the Glebe Land were to be developed as well (see below) Willersey would more than double in size and increase by 140%. The Broadway Road permission is in the Cotswold Area of Outstanding Natural Beauty (AONB) so what value does the AONB have? The Cotswold Lion Magazine is the newspaper for the Cotswolds Area of Outstanding Natural Beauty (AONB). The Cotswold AONB will be 50 years old next year - will we be proud of developments in it by then? The Cotswolds is an AONB, which means that it is a special landscape and safeguarded for future generations by the National Parks and Access to the Countryside Act of 1949. Over the years the pressures on the countryside have increased and in 2000 the Countryside Rights of Way Act, (CROW) addressed that challenge. It confirmed that AONBs, shared with National Parks the highest status of protection in relation to landscape and scenic beauty. The government also placed new responsibilities on local authorities to ensure further protection for designated landscapes. The Bishop of Gloucester is to attend meeting in Willersey Village Hall about Glebe Land 7pm 6th October 2015. Further to my letter, the meeting for the village has been booked for Tuesday 6th October at 7pm in the village hall. At the beginning of the meeting I will outline the purpose of our gathering which will primarily be about ensuring that facts and questions are clarified and that everyone has heard the same thing. Once I have introduced the purpose of the meeting, it would be very helpful if someone could speak for no more than 10 minutes on behalf of the PCC to outline your key concerns and questions regarding next steps. There will then be some input to clarify the current position. This will include ensuring that everyone is clear about which land is being discussed. Towards the end of the meeting there will be the opportunity for those present to raise questions which have not been addressed. I am fully aware that people are unlikely to be in a place of agreement, but it is very important that everything is clarified regarding the present situation and the next steps. I am hoping that the meeting will be finished by 8.45pm (and most definitely by 9pm). I look forward to seeing you on October 6th, and am also aware that it would be good to get a follow-up date to meet with the PCC. PCC Further Update on the Defence of Willersey Glebe Land 17th Sept 2015. The new Diocesan Bishop (Rachel Treweek) came to her office for, I am told, her first day behind her desk on Monday last week (7th Sept). She was briefed by the Diocesan Secretary, the Archdeacon of Cheltenham and Revd Craig Bishop about the Willersey Glebe issue. (You will recognise at least two of those are major players in this saga, on the Diocesan side). She immediately sent me and the two Churchwardens a letter backing absolutely the Diocesan view Viz: that the Section 20 Notice had been properly served and as such there would be a request shortly to Gladman to commence a planning application. There have been two letters sent from the Church Commissioners to Willersey parishioners during the last week, endorsing this stance, and refusing to countenance further debate. The CC, too, relied on the Section 20 Notice. This, in spite of all parties being told that Learned Counsel has given his Opinion that the Notice was fatally flawed for lack of specificity; that the PCC had not been given informal notification several months earlier, as recommended by the CCs own Code of Best Practice; despite the fact that Revs Debbie Forman and Craig Bishop were aware of the intended transfer and eventual sale by virtue of their membership of two separate Diocesan Committees ( at which they were both present) when the issue was formally discussed during the early months of this year; despite their attendance at a Site meeting on the Glebe land in question in Willersey on 18th May; despite Revd Forman being asked to explain the purport of the action 20 Notice on 20th May, and promising to alert the PCC if there was anything significant that the PCC should know. No such advice was proffered. The PCC remained completely unaware of the intended development, and were not put on notice of it until July. It is now abundantly clear that all the main players on the Diocesan side knew exactly what was happening, and that it appears, on very strong evidence, that there was a concerted and determined intention on the Diocesan side that the PCC should remain in ignorance until after the closing date, specified by the Section 20 Notice had passed, and they could declare that no objections had been raised. From then on, the Diocese and now the Church Commissioners, have closed their minds and ears to considerations of equity, and pursued what appears to have been the intention from the start - sell at any price and despite the C of E declared policies of always reflecting upon the views and sensitivities of parishioners. More concerning is the fact that the incoming Bishop has apparently made a decision without hearing both sides of the argument, and despite repeated requests from the PCC for a meeting with her. If that is indeed the case, it augers badly for the future, and will cause widespread disappointment. I have written asking whether her intended visit to Willersey to meet parishioners and the PCC is prior to any decision to allow the land to be developed ie: to help her to come to a balanced decision, or whether it is ex post facto, and simply to explain and excuse a decision already made. I have been awaiting a reply for just over a week! All of this has a marked similarity to what occurred in Huntley, Forest of Dean, in which the Diocese and the CC behaved in much the same way. Stop Press � PCC Update on the Defence of Willersey Glebe Land Handbrake applied! On 25th August 2015, members of the Parochial Church Council (PCC) met the Archdeacon of Cheltenham (the Venerable Robert Springett). He was joined by Rev.d Debbie Forman (Team Vicar) and Rev.d Craig Bishop (Team Rector). The PCC had pressed the Archdeacon to cause all actions concerning the proposed sale of the Glebe land to be suspended pro tem to avoid a repeat of what had occurred in the village of Huntley, Forest of Dean where, in similar circumstances, Gladman LLP had �jumped the gun� and made a formal application for planning consent, in contravention of established protocols. The Archdeacon confirmed that Gladman has been instructed to disengage on Willersey until further notice. • The Diocesan Secretary is giving accounts of his activities and intentions to the Archdeacon and other Diocesan colleagues which is radically different to that given to PCC members by him and the Diocese�s confederates, Gladman LLP, at the meeting on 10th July. The Archdeacon asked for time to consider what he had been told at this meeting. It was impressed on him that the standing of the Diocese and clergy is diminishing as damaging facts continue to emerge; that opposition to Diocesan plans continues to grow; that the reputation of the Diocese and the Church of England will continue to suffer; that any delay in resolution would only exacerbate this regrettable situation; and that time is of the essence. We will continue to keep you up-to-date with further developments. The application of the handbrake, for the time being, demonstrates the effectiveness of Willersey's initial opposition. We must keep this up! If you have not yet written to the Bishop to express your outrage and opposition, please do so as soon as possible. Points to make, address to write to and examples of letters already sent are below. The PCC needs to make Parishioners aware of major building developments intended by the Gloucester Diocese of the Church of England, in addition to those plans already granted permission or under consideration. The details are contained in the following letter, sent by the PCC to the Bishop of Gloucester, dated 20th July 2015. We are determined to oppose this imposition and will keep you informed of developments. In the meantime, we shall be pleased to answer any questions on this matter. We welcome you to our Diocese and regret that this must be our first contact with you. We are forced to write to you with regard to the Diocese's intention to sell the glebe land in Willersey. 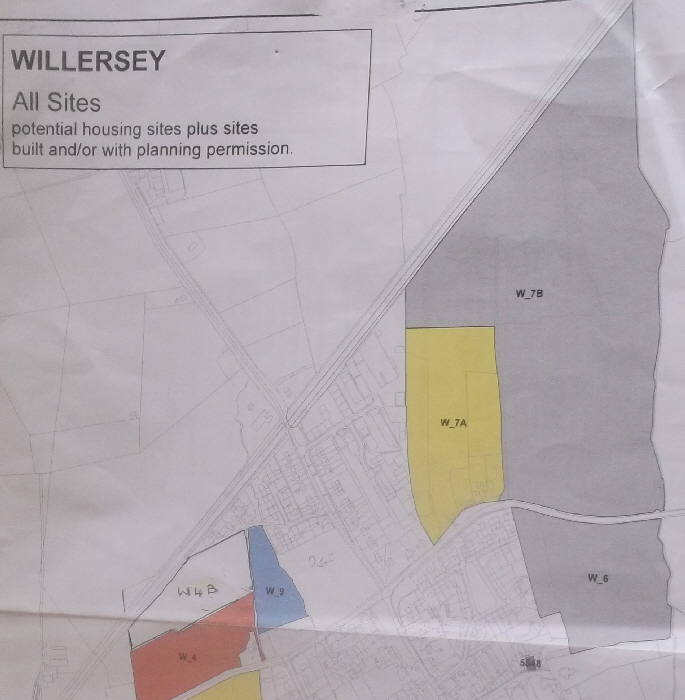 The Willersey Parochial Church Council (PCC) was only notified of these plans on Tuesday, 7th July 2015, and was invited to attend a meeting, three days later, on Friday, 10th July. The Churchwardens and the Vice-Chairman of the PCC duly attended that meeting, hosted by Rev'd Craig Bishop of Chipping Campden. 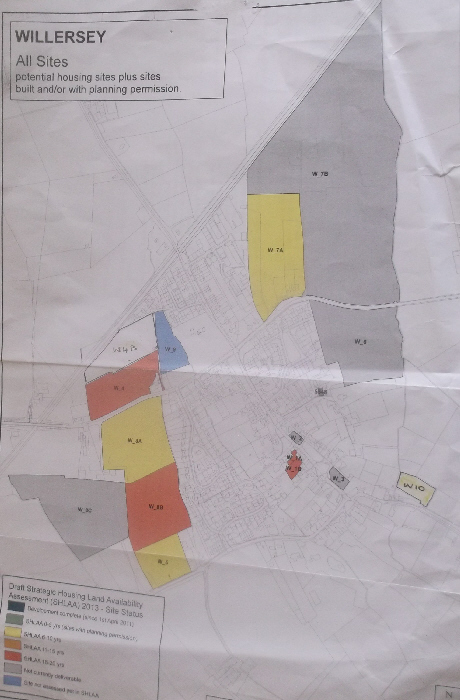 Also, present were Mr Preece-Smith (Diocesan Secretary), Mrs Taylor (Glebe Surveyor), from your Diocesan staff, and representatives of Savills and Gladman who have been instructed by the Diocese to arrange for the land to be sold to be the subject of a substantial housing and industrial development. We were only invited to participate in the hope that we could be engaged in convincing our Parish to accept this scheme. It was immediately apparent at this meeting that the Parish was being presented with a fait accompli: The Diocesan Secretary admitted that the Diocese has been actively considering this development since September last year and that the developers have been carrying out detailed investigations on eight Glebe sites within your Diocese. Of these, Willersey and a parish in the Forest of Dean, have been singled out for sale and development. •	This intended initial imposition by the Diocese of circa 100 new dwellings; in addition to the number already earmarked, being wholly disproportionate; it would cause Willersey's development quota to be exceeded by 200%, at the same time as destroying the current, cohesive nature of the community and completely changing its essential character. The Diocesan Secretary was previously unaware of any of these factors but made it clear that he had no interest in them, whatsoever, and that the Diocese would be taking none of them into consideration nor allowing them to deflect it from its determination to impose this development upon our village. If this major development were allowed to proceed, the Diocese would retain land, north of the B4632 and the two fields south of that road, adjacent to Saint Peter's churchyard as ‘dowry land’. We were appalled to hear the Diocesan Secretary admit that he intended to sell the whole of this remaining land for development at the earliest opportunity. •	that his only purpose was to sell off whatever Glebe land he could, in order to raise funds to further the broader work of the Diocese and that he had a strict duty under Charities law to do this; refusing to accept that the Charity Commissioners expect responsibilities to be discharged with common sense and a degree of proportionality. As we made clear, our parishioners cannot be accused of “NIMBY-ism”. They have been understanding of the need to accept the building of additional housing; indeed, following the recent planning activity, Willersey has been held up, in the District, as the example of how communities should enter into such processes positively and constructively. We pointed out to the Diocesan Secretary that his decision was bound to attract an adverse reaction, well beyond the bounds of Willersey, and that the Church of England would thereby invite considerable criticism and be seen to be riding rough-shod over the views of its own congregation and local parishioners. He was intransigent. Finally, we put it to him, several times, that he was only concerned with financial benefits to the Diocese administration and not with any other factors concerning the community at large. Several times, he agreed! We cannot believe that you will be content to find that your Diocese thinks it right to impose its will on a parish just because it believes it can, nor that you would intend for our church, the Church of England, to become an organisation for which the ends justify the means, however appalling their consequences. We earnestly hope that you will halt these proceedings and reconsider. Of course, we would welcome a meeting with you. The Lord Dear (Vice-Chairman, Willersey PCC). Where is this Glebe Land? It is the two grey areas marked W_7B and W_8. One is next to the church and the other on the other side of the B4632. This development could add another 450 houses to the village. An article has now been published in the Church Times. Here is a picture of the Glebe Land. If you consider that the proposed development of Glebe land in Willersey should be opposed, the Parochial Church Council invite you to write to the Bishop of Gloucester as soon as possible stating your objections. The more letters the better! � That the mission of the Church of England would be severely damaged in a number of ways, including a lowered status of the Church; set back attempts to increase the relatively low congregation attendance levels; negative impacts on voluntary contributions to Church income; increased cynicism towards Church activity; detrimental impact on relations between the Diocese and its local representatives. � That due process was not complied with viz: proper notice was not given in due form, preventing the PCC from having its views made known. (NB: whilst many considerations are relevant, including adequacy or otherwise of essential infrastructure; environmental impact; existing plans for development in the village; damage to the essential character of the village � these cannot be considered in any appeal at this stage, being deemed only relevant at any later Planning Enquiry. Strange, but a fact! So��it will detract from any letter of objection if too much space is devoted to these issues, though a very brief mention in support of the paragraph concerning Best Practice might do no harm). Here is an example of a letter fron two residents of Willersey. This is the first of six letters - please scroll down for the others. We learned with dismay of the proposal by The Church to sell Glebe Land in Willersey through a notorious developer with the express desire for its development of 100 houses. The first we heard of this was when a letter, sent by our PCC to you, was published in the Willersey Parish Magazine. The tone of this letter, caused by the totally off-hand way our PCC was treated by, in particular, your Diocesan Secretary Mr Preece-Smith, at a recent meeting, has appalled us. From the PCC's letter it is clear that the only thing that has promoted and guided this initiative is the potential of a large financial gain by The Church; something Mr Preece-Smith agreed with several times during the meeting. Gladman are notorious for creating such get rich quick schemes in the hope of profiting substantially themselves through the planning process. An article was published on 23rd November 2014 in The Daily Mail where this company was stated to be already pursuing 102 planning applications on green field sites on behalf of land owners. Already the development of 20 new houses has been approved on Broadway Road, 50 are in the pipeline on Collin Lane and another 70 are likely to be sort, again on Collin Lane. That's before your proposal for a further 100 on Glebe Land. We object most strongly to your proposal on the following grounds. We believe your proposal is in breach of best practice set out by the Church Commissioners and adopted by your Diocese whereby you have clearly not shown any sensitivity regarding this issue amongst the local community. Indeed no consultation was held with the PCC, presenting the proposal as a virtual fait accompli at the meeting held on 10th July with them having been given only 3 days' notice of your proposal. We believe that the mission of The Church will be severely brought into disrepute within this community, lowering its status and doing nothing to reverse the falling numbers in the congregation. Fund raising by The Church will become increasingly difficult here. Situations such as the tremendously successful local fund raising to restore the Church bells will become a thing of the past. Given the tone of the meeting on 10th July it is also clear that relations between the PCC and the Diocese are now already strained. We believe that due process was not complied with whereby the PCC was presented with a proposal on 7th July 2015 that had clearly been under consideration for a very long time. They were then given 3 days' notice of a meeting at which they were told that their views were irrelevant. We truly hope that you will reconsider this proposal for the reasons stated above and before any more damage is done to Willersey's relationship with the Diocese. Here is a another example of a letter fron a Willersey resident. Following a public meeting of the villagers of Willersey held on the 19th August 2015, called by the Lord Dear, Vice Chairman of our PCC, in order to inform us of the outcome of a meeting between the PCC and the Gloucester Diocesan authorities, it became apparent to me that I had a moral duty to my community to write to you in the hope that despite all your many duties, you would make time to acquaint yourself of the facts and proposed actions of your Diocesan officials surrounding their stated intention to sell the Glebe Land of Willersey and to halt this process pending further investigations into the actions of your officials. The first indication that it was the intention of the Diocese of Gloucester to sell the ancient Glebe Land surrounding the Parish church of my village Willersey, to a national housing developer, was the publication in our Parish magazine of a copy of a letter addressed to you from our Parochial Parish Council. This letter concerned a meeting with the Diocesan authorities and our local clergy, called by the Diocesan Authorities. At that meeting they were informed for the first time that a decision had been taken to sell off the ancient Glebe Land bounding the Norther edge of our village. The decision was to all intents and purposes a fait accompli. The developers, Gladman Homes and their land agent Savills, who attended that meeting said it was their intention to develop this land initially by seeking planning permission for 100 houses to be followed in due course by a further 300 houses with a very substantial expansion of our small industrial estate. Approximately one year ago we as a village reluctantly agreed with our District Council that planning permission, initially for 50 houses which was later increased to 80 houses, could be absorbed into our community, even though this would mean that all local facilities such as schools, G.P. services, etc. would be unable to cope without significant expansion. This announcement by the Diocesan Authorities of its decision to join with a property developer to aggressively push for a further 100 to 300 additional houses on top of our agreed 80, has come as a bolt out of the blue and if successful, will destroy ancient agricultural land and greatly damage our village community. At the above mentioned Public meeting called by the Vice Chairmen of our Parochial Parish Council The Lord Dear, and attended by our Senior Church Warden, and our Member of Parliament Mr. G. Clifton Brown, and some 200 villagers, it was made very clear that this whole matter has been handled by the Diocesan authorities in a very questionable manner giving strong grounds for objections to this proposed sale. 1. The proposals is in breach of best practice as set out by the Church Commissioners and adopted by the Diocese, that sensitivity must be shown to local communities affected by the proposal. To date this has been totally ignored to the degree that your representative stated that he had no intention of entering into or discussing any issues other than the sale of the Glebe Land. 5. Detrimental impact on relations between the Diocese and its local representatives. This damage to, and division in, our community is already rearing its head at a local level. There is bitterness and hurt being felt by our community at the apparent arrogance of the Diocesan Authorities in seeming to attempt to avoid the clearly laid down steps required before carrying out their proposed actions, as well as their recorded dismissal of all other considerations as irrelevant, other than the raising of funds by the sale of Glebe Land. This bitterness resulted in emotional pleas being made at the Public Meeting of the 19th of August by our Parochial Parish Council and members of our congregation, that our local clergy should not be accused or blamed for conniving with the Diocesan authorities to push this sale through as quickly as possible and with the minimal amount of consultation, while the attention of the Church was momentarily elsewhere. Also, because of such strong local feeling, our PPC has felt it necessary to publicly dissociate themselves from the Dioceses actions, and have stressed in the strongest terms that they had no prior knowledge of the intentions of the Diocesan authorities until they were informed at the Diocesan/PCC meeting of a few weeks ago. The Diocesan actions they stressed had put them in an intolerable moral position. They also pointed out that as soon as they had been made aware of the Diocesan intentions they had immediately taken action to inform the Village and to express to you their feelings of betrayal. 3. That due process was not complied with in that proper notice was not given in due form, so preventing the PCC from having its views made known. That this has not been complied with is self-evident. In view of the above I believe it is absolutely essential that as a matter of urgency you instruct your officials to halt this matter before it gets totally out of hand, so that a proper and measured review of all the actions and motives of those involved can be investigated. If it is then decided that this sale should go ahead at least all the implications for the Church and its community will be fully understood, and the short term damage and the long term and much broader implications for your mission accepted by you. In conclusion the proposed sale of our ancient Glebe land with its classic Ridge and Furrow field system that for 1000 years has wrapped itself protectively round our Church and Village, is seen by many not only as a financial transaction that would provide in the short term badly needed funds for the Church Temporal, but also and of much greater significance, as the penultimate step in the physical retreat of the Church from Willersey. This slow retreat from our village by the church, started some 38 years ago with the resignation of our last resident and much loved Rector, the Rev. Godfrey Evans. This was closely followed by the amalgamation of the North Cotswold Parishes and the sale of our Rectory. Now with the proposed sale of the Glebe land, we see and fear the final step of this process. That is, closure of our Church and the final abandonment of Willersey as a centre of worship. The reality of this potential fate after a thousand years of continuous worship, can be seen in the closed doors and overgrown Church yard of our close neighbour, Saintbury Church. At the end of the day, this proposed action by the Diocese may be driven through by the Church and you're Developers, despite the inevitable damage to our belief in the Church's commitment to its own stated principals and morality. This may in the short term release much needed funds for the Church. But against gaining this perceived windfall must be weighed the much greater long term Spiritual and Communal damage that will be seen to have been inflicted by the Church on its own God Given Ministry, and upon our Christian and Village community. Once inflicted such damage cannot easily be repaired and though we are a small village situated in the far reaches of your Diocese, each small cut inevitably diminishes belief in the whole. It is not a time for the church to be selling its Birth Right, but one for connecting again with the broad community, most of who were christened into the Church of England, and still yearn for dynamic and inspirational spiritual and moral leadership which you are uniquely able to give. Here is a third example of a letter fron a Willersey resident. 1. That the proposal is in breach of best practice set out by the Church Commissioners and adopted by the Diocese, namely that sensitivity must be shown to local communities affected by the proposal. In fact this proposal shows a complete lack of sensitivity and will be damaging and life changing to the essential character of this Village. 2. That the mission of the Church of England would be severely damaged in a number of ways, including a lowered status of the Church; and set back attempts to increase the already existing low congregation attendance levels; will certainly have a further negative impact on the voluntary contributions to Church income; and will considerably increase the existing cynicism towards Church activity; and have a further detrimental impact on relations between the Diocese and its local representatives. 3. That the due process was not complied with, namely that proper notice was not given in the due form, preventing the parochial Church Council from having its views made known. I hope you will be able to accept that my objection is reasonable and that the future of the Christian mission in traditional village society is not to harm the fragile cultural infrastructure that exists. Our Village has 800 residents, 200 of which are under 25 years and need local jobs and reasonably priced housing, none of this is currently provided for in the Plans by the Developers or their clients. Here is a fourth example of a letter fron two Willersey residents. Following upon the publication of the August edition of the ‘Church and Village News’ and the village meeting held on Wednesday last, 19th August, we protest against the conduct of Diocesan staff in the manner in which they have dealt with the proposed disposal of the glebe land. Initially the glebe land earmarked for sale by the Diocese for housing and industrial development is land north of the B4632 known as ‘Terrify’, adjacent land known as Lower Marbrook, and land adjacent to St Peter's Church known as Upper Marbrook. It has now become apparent that, from September 2014 until July 2015, the preparation of plans to dispose of the glebe land were deliberately concealed from the Parochial Church Council (PCC) and therefore from the parish and village as a whole. That constitutes exactly the kind of devious, underhand deception to be expected from an avaricious and unprincipled developer but not from the established Church of England. In this context, it is unsurprising that the Diocese has engaged as its advisors and agents Messrs Savills and developer Gladmans whose reputation for aggressive behaviour is widely reported. It is simply appalling that officers of the church should stoop to such malpractice. That conduct can only have the effect of causing serious damage to the standing of the Church of England in the community and a general increase in cynicism about the motives even of those who genuinely seek to serve in the pastoral work of the church. We understand that the legal notice given by the Diocese and copied to the PCC was a model of obfuscation. In the opinion of an eminent QC, the notice failed to meet the standards required in law, in that it failed to provide sufficient (or any) information from which the true intentions of Diocese could be obtained. This is another example of underhand stealth in the conduct of officers of the Diocese. How can such behaviour be regarded as acting with sensitivity towards the community affected by the proposal in accordance with best practice and adopted Diocesan policy? That notice should be set aside in law and in the interests of transparency between the church and its parishioners. In the circumstances, we appeal to you to seek to make good some of the damage inflicted upon the church as a result of the misbehaviour and malpractice outlined above by withdrawing the notice and disciplining those responsible for the conduct of this matter to date. Here is a fifth example, in this case of an email, fron a Willersey resident. At the meeting in the Willersey village hall last evening attended by media representatives, Geoffrey Clifton-Brown MP, our local District Councillor and over 160 villagers , we heard from the PCC Vice-Chairman Lord Dear and the Senior Churchwarden of the apparent sharp practice that has been employed by diosacean officers in league with a national property developer and a national estate agent to push through plans to sell off the 37 acres of Willersey's greenfield glebe land for housing and industrial development before the arrival of the new bishop. I wrote to the bishop on 14 August protesting about the sad state of affairs using information from the PCC that was available to parishioners. At last evening's meeting we heard more of the case, of the secretive and unannounced site meeting held on the land attended by the Team Vicar, the Parish Priest and representatives of the developer and the estate agent. We understand that the latter two people had been given to understand that the parishioners had been told of, and had accepted, the basic sale plan which had gone to the Church Commissioners because there had been no formal objections. There had been no objections because the warning letter to the churchwardens had been (probably intentionally) obscure and unclear. When the churchwarden sought help from the parish priest I understand that she claimed she too did not understand the letter although she had attended the site meeting some three days earlier. I may well have misunderstood the facts of the case and would be delighted if you or your staff could advise me on the facts if I am wrong. While I am sure that Lord Dear will impress upon you the strength of feeling in Willersey when he meets you on 25th August, I send you this email to express my personal concern over the rather questionable adherence to �best practice� demonstrated by the diocese in this matter. I have already copied the facts to the editor of Private Eye magazine as they collect such gems and I will do my best to ensure that other national media are informed. A Cotswold Journal reporter was present at last evening's meeting and it would surely be appropriate if you or your colleagues could tell the press before their next issue that the Willersey glebe sale proposal had been halted pending a proper decision on the matter by the new bishop on her arrival next month. Here is a sixth example of a letter fron a Willersey resident. You will be aware that the Lord Dear, Vice Chairman of Willersey Parochial Church Council, recently briefed the village of with regard to the above proposal and the outcome of a meeting between the PCC and Gloucester Diocese representatives. The purpose of this letter is to complain about the manner in which representatives of the Gloucester Diocese have conducted business on behalf of the Diocese, in particular their failure to engage appropriately with the PCC and the parish regarding proposals that will have a major impact on this community. The first indication we had that it was the intention of the Diocese of Gloucester to sell the land adjacent to Willersey Parish church was the publication in our Parish magazine of a letter addressed to you from the Parochial Church Council. It is extraordinary that the Parochial Church Council were informed in such a dismissive manner that a decision had been taken to sell off the glebe land of our village, and that the Diocese representatives appear to think it is acceptable to treat the community with such disrespect by failing to consult and by trying to present their proposals as a fait accompli. What is also extraordinary is that as this story unravels we learn that there are more houses planned than indicated in the initial proposal which suggests an unhealthy relationship and sleight of hand between Diocese representatives and voracious developers. What makes this more astounding is that during 2013/2014 Willersey villagers were active participants in a Cotswold District Council led Development Strategy to establish the Local Plan for future development in the village, the Diocese representatives were contacted but did not engage with this process or the subsequent consultation. 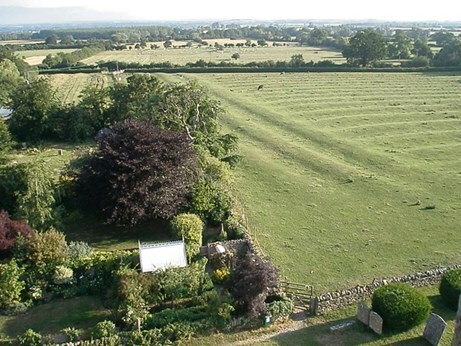 This Local Plan took into consideration protection of land within the AONB and other ancient ridge and furrow sites, the current Diocese proposal does not consider these sites as important. That the proposals are in breach of best practice set out by the Church Commissioners and adopted by the Diocese. No sensitivity has been shown to the community affected by the proposal, the PCC have been excluded from discussions and there was no meaningful consultation. That the mission of the Church of England would be severely damaged. There are serious reputational issues for the Church in treating the PCC and the community in such a dismissive way, this has already had a detrimental impact on relations between the Diocese and its local representatives who have been placed in a very difficult position. It is an extremely damaging, high risk strategy for an organisation to appear to be so untrustworthy and devious by ignoring the need to engage in open dialogue with the communities it serves. That due process was not complied with and proper notice was not given. The PCC were not given the opportunity to make their views made known, they were not consulted. Also Church representatives could have engaged with the Cotswold District Council Local Plan initiative which would have been a more transparent and accountable approach to engaging the community. Geoffrey Clifton-Brown MP has written to the Second Church Estates Commissioner, the Rt Hon Caroline Spelman MP, asking her to look into the Parish's complaints to the Church Commissioners about this matter. Over 200 Parishioners attended the PCC's public meeting in the Village Hall on 19th August to be updated on the campaign and to find out how to get involved to stop this action. Robert McNeil-Wilson and the Lord Dear represented the PCC and welcomed Geoffrey Clifton-Brown MP, Lyndon Stowe, Chairman of the Cotswold District Council and members of Willersey Parish Council. The Lord Dear acted as Chairman and explained the roles of the Parish Council, PCC and Diocese. He described events since the Diocese's issuing of the mandatory notice of its intention, and how this is likely to fail because the PCC has taken Leading Council's opinion and is working to demonstrate to the Church Commissioners that the notice is so unclear and unspecific as to be meaningless. He also explained how church employees have acted to prevent the PCC from objecting to the Diocese's intentions. On 18th May, at the time that the Churchwarden was finding it difficult to obtain clarity of what the Diocese's opaque letter and notice meant, the Diocesan Secretary, engaged in trying to drive this development forward, held a site meeting on the glebe land. He invited other Diocesan employees; the Benefice Team Vicar, Rev'd Debbie Forman and the Vicar of Chipping Campden, Rev'd Craig Bishop. The Churchwarden's and Willersey parishioners on the PCC were excluded from this meeting and kept unaware of it until it was revealed in a response letter from the Church Commissioners in August. When Rob McNeil-Wilson mentioned his difficulty in obtaining any more information at May's PCC Meeting, three days after the site meeting, the Rev'd Forman pretended a lack of knowledge about the Diocese's intentions, despite having had it explained, on-site, three days earlier and volunteered, then failed, to provide this information in time for the PCC to respond to the Diocese. Councillor Steve Jordan explained how the Parish's ‘quota’ for house building development had been achieved. The meeting was opened for questions and this revealed widespread disquiet and anger at the Diocese's intentions and the way Church employees had conducted themselves. David Griffiths wished to avoid a “blame game”. Several parishioners urged the PCC to take appropriate action in response to the conduct of certain clergy and other Diocesan employees. The PCC will raise these matters at its meeting with the Archdeacon, Robert Springett, to protest against the Diocese's actions to date and seek a restraint. 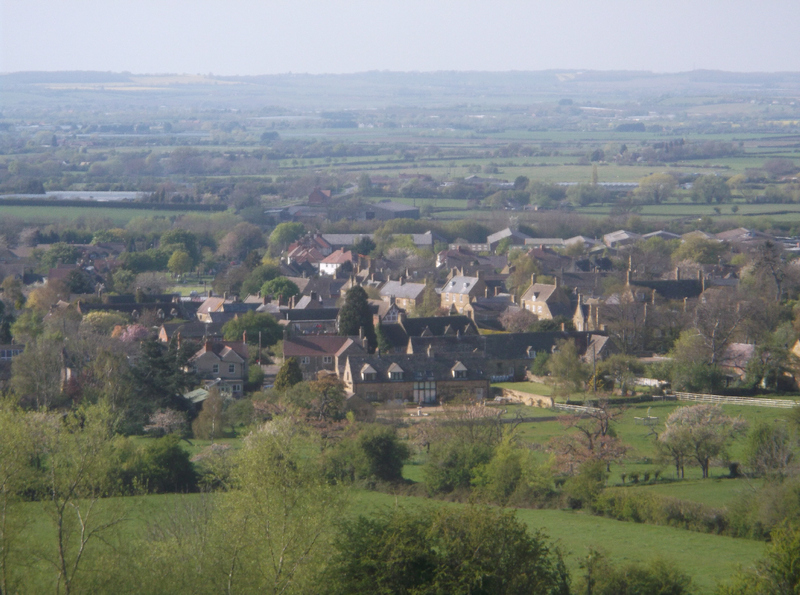 Given the apparent level of anger at and opposition to the Diocese's intentions and because all present felt strongly that the Parish had accepted as much development as was reasonable with the attainment of its quota, a vote was taken “that the Parish Council petition the Cotswold District Council to remove all of Willersey's glebe land, including the land known as ‘Terrify’, from the SHLAA” (Strategic Housing Land Availability Assessment). The vote was unanimously in favour of this proposition. Robert McNeil-Wilson concluded the meeting by saying that revelations about the Diocese's intentions and the actions of church employees had been damaging to the Church of England and its Mission. He urged parishioners to remember that the Church of England in Willersey is not the ruthless, cynical employees pursuing this action on behalf of this uncaring Diocese; it remains the Church of the King James Bible and the Book of Common Prayer but most importantly, all it is all those people who call themselves members of the Church of England in the Parish of Saint Peter's, Willersey. He urged everyone to pray for victory in this campaign and for the Church of England. The Parish Council wishes to reiterate the thanks he expressed to all the people who attended. A record of names and contact details was taken from those present to enable the PCC to keep them informed and involved in the campaign. Parishioners are urged to write to the bishop to express their opposition, making particular reference to the inevitable damage to Mission (i.e. Church of England congregation and membership numbers etc). A village in Cornwall faced with the threat of the sale of Glebe land. Any increase in the number of houses as proposed for Willersey ( and the surrounding villages ) will need a look at the cost and capability of our infrastucture to cope with extra demand.